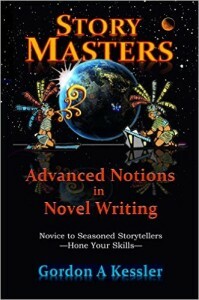 StoryMasters for novice to advanced novelists; It’s a labor of love of over a quarter century writing novels and teaching the craft from Gordon Kessler. My new book on novel writing is just out and I’m running a FREE eBook promo on Amazon (today 9/8 and tomorrow 9/9 only). This entry was posted in Blog and tagged Amazon and Kindle books, Gordon Kessler, KWA news, Member news, Writers Tools. Bookmark the permalink.